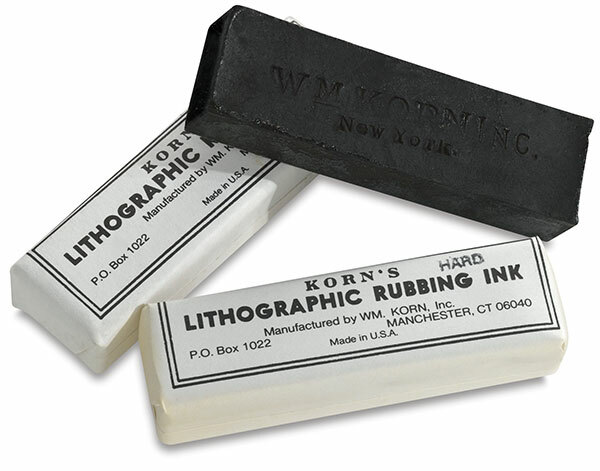 A type of "lithographic crayon," Korn's Lithographic Rubbing Ink Sticks are used to transfer delicate tints and to create delicate, graded areas of black that look similar to smudged charcoal. They are much greasier than other lithographic crayons, and are available in three forms — hard, medium, and soft. For the best results, use them last rather than under other crayons. To use, wrap a piece of chamois, silk, or nylon cloth around your finger, rub it onto the Rubbing Ink Stick, and then gently rub the ink onto the stone using a circular motion. The amount of ink used, the pattern of application, and the pressure of the application will result in different gradations and tones. Korn's Rubbing Ink Sticks may also be used to draw directly on the stone but care should be taken to avoid overwork, which may result in overdarkening. Each stick measures 3" × 1" × 1".